Weight lifting improves spinal stability and movement. When you lift and move in an upright position, your spine and other muscles in your torso and hip work hard to keep your body in alignment and to control movement. Weight lifting often carries the misconception of either bulking up like a bodybuilder or lifting colorful dumbbells that weigh less than your purse. In fact, you can do a variety of healthy weight-lifting exercises to strengthen your spine and move better without the need for grunting like the guys doing bicep curls at the gym. Since most people spend a great deal of their time in a sitting position at work or in school, weight-lifting exercises for your spine performed in a standing position should counteract the negative effects of prolonged sitting. Place a 30-pound kettlebell on the floor in front of you. Stand with your legs about shoulder-distance apart. Bend your torso forward at your waist and grab the kettlebell's handle with both hands. Keep your knees slightly bent and do not round your spine. Exhale and thrust your hips forward to bring your torso upright, which helps you lift the weight off the floor. Inhale and lower the kettlebell to the floor by bending your torso forward at your waist without hunching your spine. Perform three sets of eight to 10 reps. Hold a 10-pound dumbbell in each hand over your shoulders with your elbows close to your body. Stand with your legs about shoulder-width apart and your feet pointing forward. Inhale and squat down as low as you can while keeping your chest up. Do not spread your feet too far out to the sides, and do not hunch your back. Exhale and stand straight up, pressing the weights overhead at the same time. Do not shrug your shoulders. Inhale and lower the weights to your shoulders. Perform three sets of eight to 10 reps. Stand with your feet together and hold a 10-pound dumbbell in each hand over your shoulders with your elbows close to your body. Step your right foot forward and lunge straight down until your left knee gently touches the floor. Exhale and step back to the standing position, pressing the weights overhead at the same time. Lower the dumbbells back to the starting position. Perform three sets of eight to 10 reps per leg. Stand with your feet together and carry a 20-pound kettlebell in each hand. Walk in a straight line for 20 to 30 paces without shrugging. Keep a steady breathing rhythm as you walk, which helps to engage your core and spinal stability. Turn around and walk back another 20 to 30 paces to the starting point. Rest for 30 to 45 seconds before doing two to three more sets. To work on more spinal stability, carry or lift one dumbbell or kettlebell instead of two, suggests Dr. Stuart McGill, a contributing writer for the IDEA Fitness Journal. This challenges other stabilizing muscles in your torso, such as your obliques and deep spinal muscles, to maintain movement control and balance when you move. Use a lighter weight if you cannot perform the exercises with proper form. Use a heavier weight if you can do the exercises easily with little sweat. 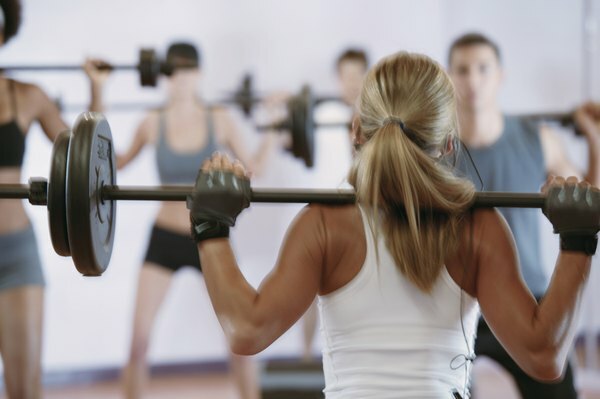 Work with a qualified fitness coach if you are new to weight lifting.